There is evidence that early Homo Sapiens engaged in Ironing. In what is now upper Silesia, the preserved remains of a 40,000 year-old, Boreal-forest dwelling Cro-magnon hunter-gatherer tribe clearly depict the use of heated rocks to soften and smooth animal hides. These rocks were superheated in fires, and then deposited on and moved around various hides–Bear, Reindeer, Walrus–by means of large hinged branches. Beef tallow was also used as a softening agent. It is believed that, in addition to aiding in the enzymatic process of softening the tissues of the skin, this tallow, when heated, acted as a “repressant” to the various bugs, larvae, and eggs ubiquitous in animal hides. The result was softer, smoother more hygienic hides, and a subtle but distinct evolutionary advantage: The cave-dweller with the soft hides clearly held a competitive advantage in the libertine sexual atmosphere of late Ice-age steppe nomadic lifestyle. And so was borne a deeply rooted, almost chromosomal, predisposition to have our clothes pressed. 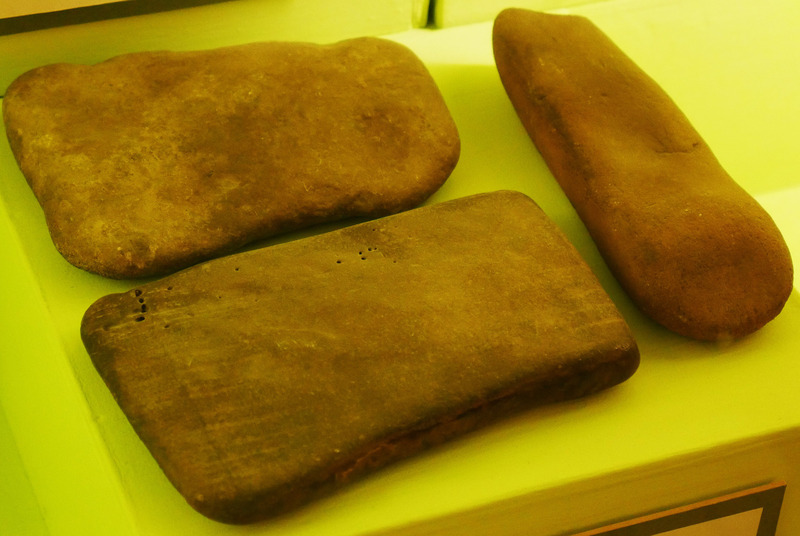 The modern iron, by contrast, has it’s roots in the late middle ages, in Norway, where the salty demands of that nation’s sea-going citizenry bore fruit in the form of a solution to the problem of wrinkled hairshirts: the Sleksje, or Slickstone. 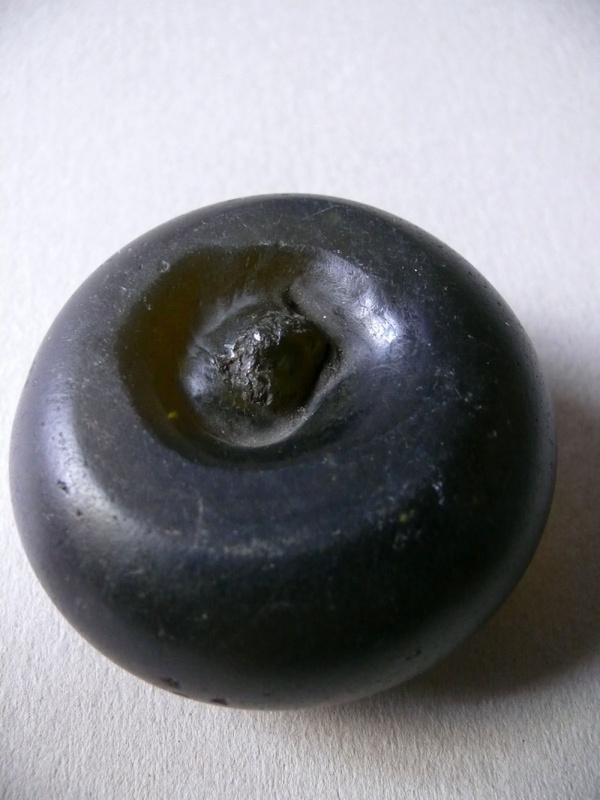 A hollow, heavy-bottomed, inverted glass mushroom, presumably evolved from the ancient stones cited above, the Sleksje was evidently used both with and without hot coals inserted in the hollow cap of the mushroom. The smooth glass surface repressed wrinkles and smoothed the feral fibres of the garment, creating a softer tunic. The Slickstone’s cousin, the Linen Press, was an early Celtic invention. Adapted, it appears likely, from the ancient apple presses of the Cider-loving Breton peoples of Northwest France (think: Asterix), the linen press simply squeezed the linen between smooth wooden plates, like a grownup-sized flower press. An ancient series of pictish images on a bronze mirror unearthed in Cornwall, and dating to the 13th century, depict, amidst depictions of ritual slaughter and snake mythology, a calm domestic scene of a man doing his pressing. The Mangle-board, and it’s brother-in-arms, the Mangle-box, represent another variant on the non-heated pressing fertile crescent that was Northern Europe in the Middle ages. Simply, smooth wood used to roll the wrinkles out of bolts of uncooperative linen, Mangles are notable for having achieved a level of ornament at odds with their humble purpose, and survive today in bourgeois collections that, like most of their kind, celebrate the kind of work that the people who collect them have never performed. The Mangle Box (or, Box Mangle), was simply an early 17th century mechanization of the mangle-board, adapting a stone-filled, smooth-bottomed box for the mangle-board, and allowing the user to feed bolts of cloth in at one end, and have them rolled and pressed smooth. Of course, the historical box-mangle is often mis-credited as what is more commonly known as a “wringer,” as evidenced in this Derek & Clive song. Like a pouring of large and small pearls into a plate of jade. The Chinese pan-iron remained in vigorous use throughout the latter dynasties, supplanted only later, along with much of the Chinese currency, by the Imperial oversights of the British. Relayed, like much of the enlightenment, by Marco Polo in his vital Book of the Marvels of the World, the heat-bearing metal iron soon gained currency in the west. The first iteration of this oriental concept was a solid, forged metal tool known as the Sad Iron. The Sad Iron is to the modern electric iron as Homo Erectus is to ourselves: A simple glance at this tool confirms it as a progenitor of our modern appliance–if nothing more. Crafted of forged pig-iron, bearing that distinctive rounded isosceles form, and quite heavy, the Sad Iron was the first common-use iron to achieve some semblance of democratic embrace by a broad population, and was widely used beginning in the late middle ages. Sad ironing was, as its name suggests, a far from happy chore: Irons had to be heated over special fires, separated from the soot and grime of the flame (lest one ruin the very clothes one was trying to perfect) by a heavy steel or iron plate, and constantly monitored for proper temperature. A minimum of two irons was mandatory–one to heat, the other to press. These irons had to be regularly sanded, oiled, and waxed before heating; then gripped with a sturdy cloth to bear to the materials. Water, sprinkled on the clothes, then facilitated the pressing of the garment. Sad irons were a climax invention of their kind, elemental and largely unimprovable. 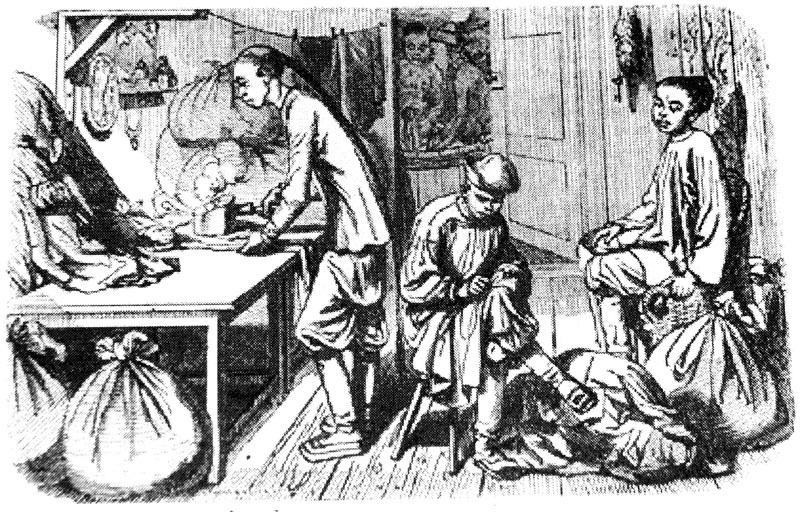 They were, in Antebellum times, primarily the province of the Chinese, whose ironing skills were–and remain–without peer. Using these heavy, hot, irons required little skill beyond a certain thermal fortitude, and as the ubiquitous Chinese laundries proliferated through antebellum America, sad-irons became a common urban artefact. A rare amelioration of the sad iron, however, was delivered by the famed Mrs. Potts of Iowa, an anomalous early entrepreneur whose “Detachable Cold-Handle Sad Irons,” patented in 1872, revolutionized the domestic ironing business. Promoting her invention through a series of humorous advertisements, Mrs. Pott’s was an early avatar of American derring-do, at a time when women were still largely invisible in the worlds of business and entrepreneurship. Mrs Potts’ sad irons solved several key aspects of the ironing conundrum: By sporting a detachable wooden handle, her irons allowed the user to grip them without fear of burns, and to switch cooled irons out with hot at a moment’s notice. By keeping a few “irons in the fire” at all times, Mrs. Potts invention allowed the housewife to speed her domestic chores, that she might achieve some small solace in an otherwise tedious life. 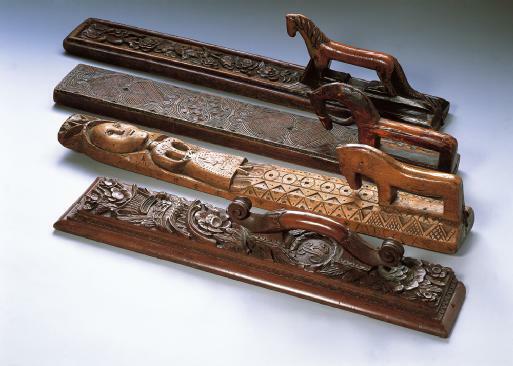 Sad irons had an impressive run through the history of Ironing, but still bore the three hindrances endemic to all pre-modern irons: Their heat could not be regulated, they cooled too quickly, and they did not bundle a moisture function within the device. Indeed, the first invention to effectively overcome these pernicious limitations would stand to reap the just rewards of a burgeoning domestic empire. …to be concluded in Part II.